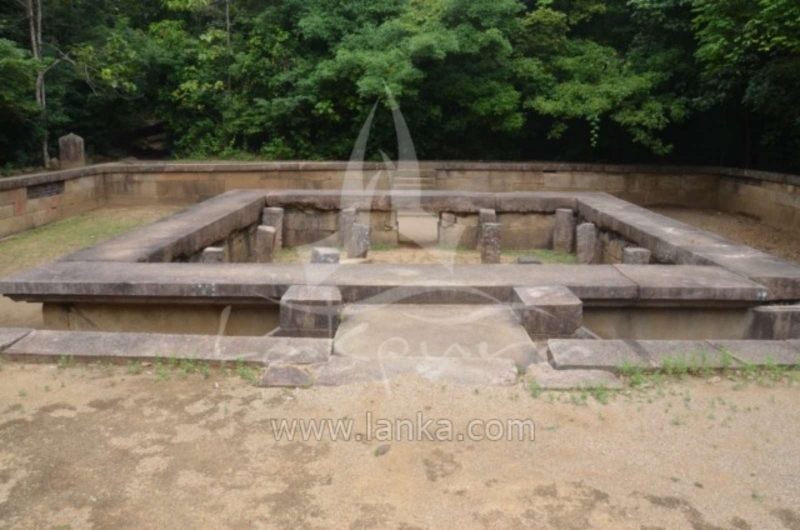 Ritigala is located 188 km north-east of Colombo, at Ganewalpola, near Kekirawa/Maradankadawala of north-central plains of Sri Lanka. 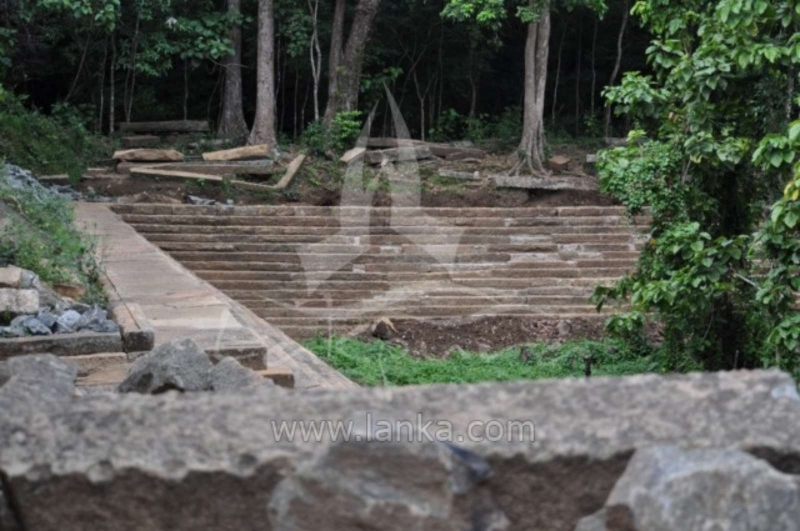 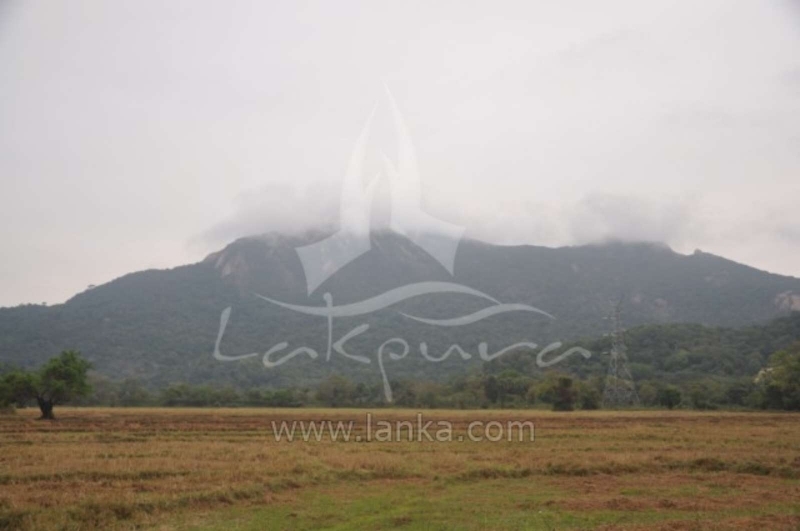 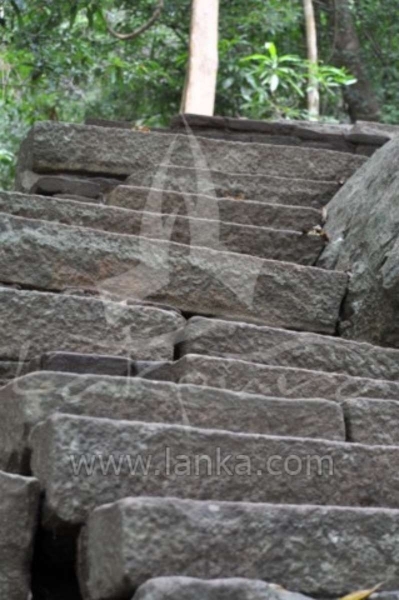 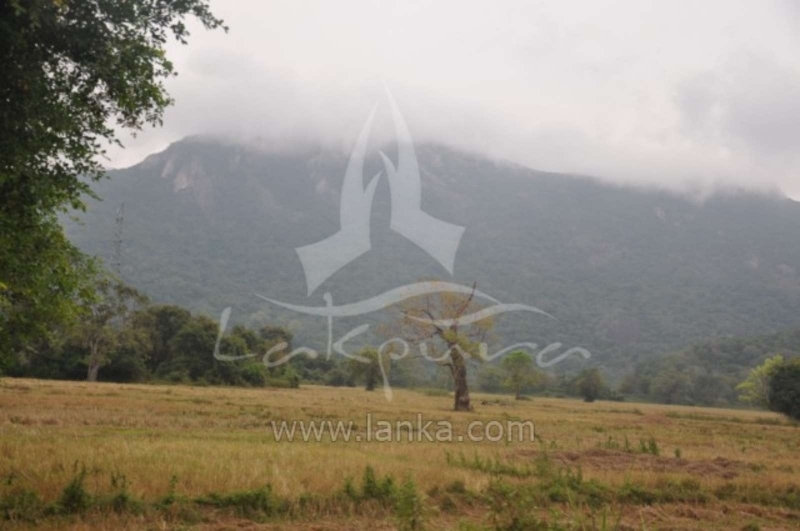 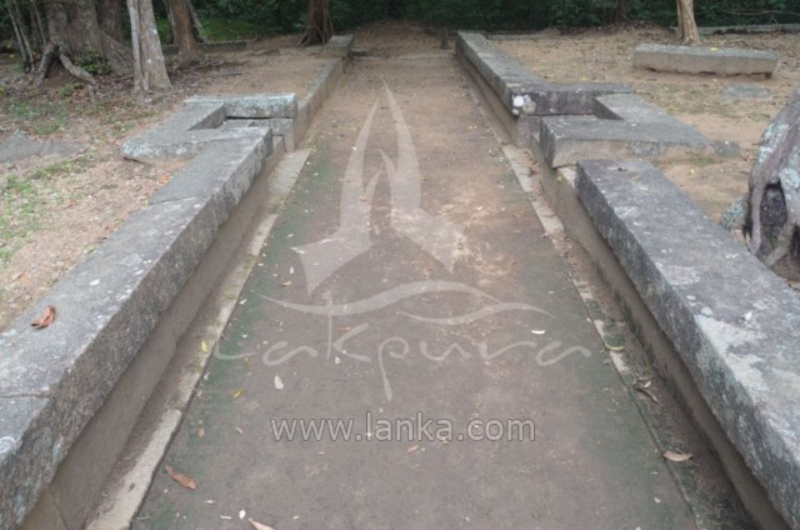 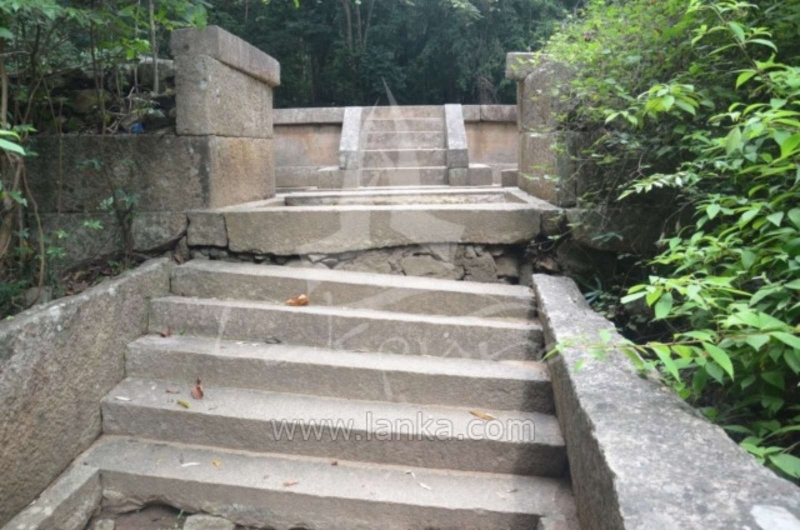 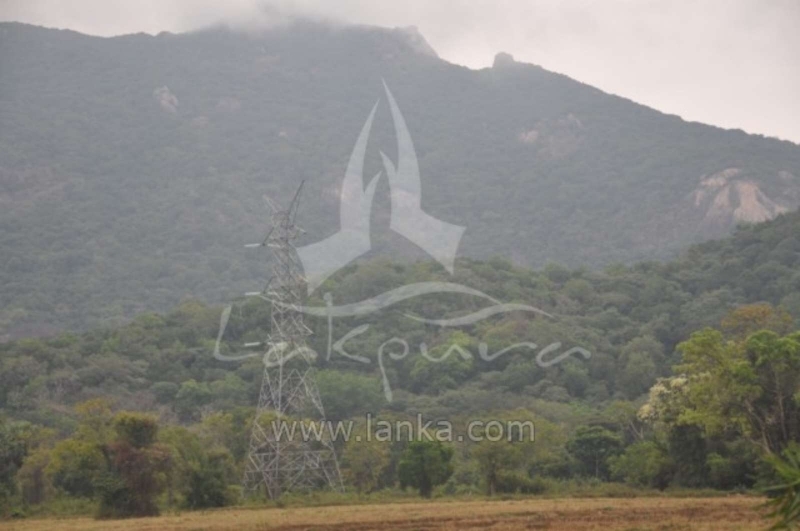 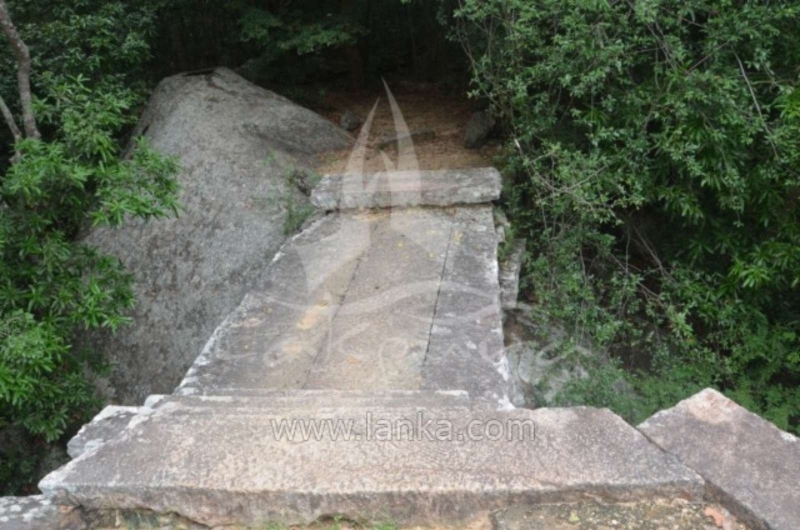 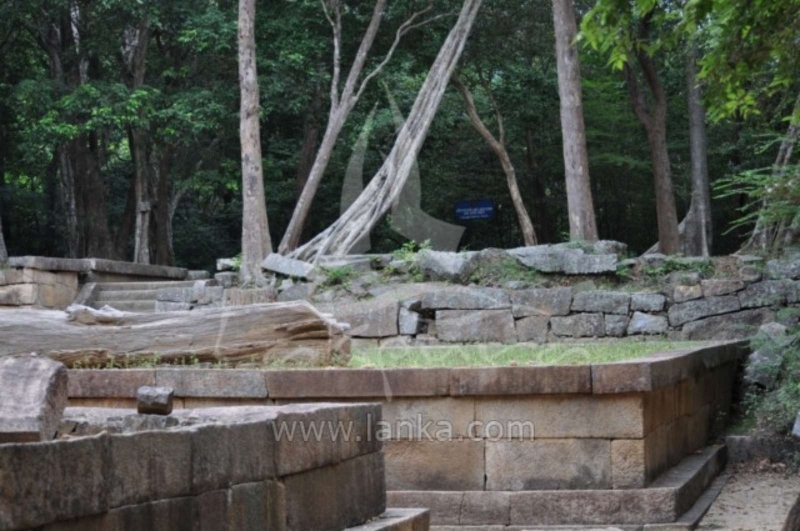 Ritigala can be reached from the turn-off from Habarana- Anuradhapura Road at a distance of 12km from Habarana. 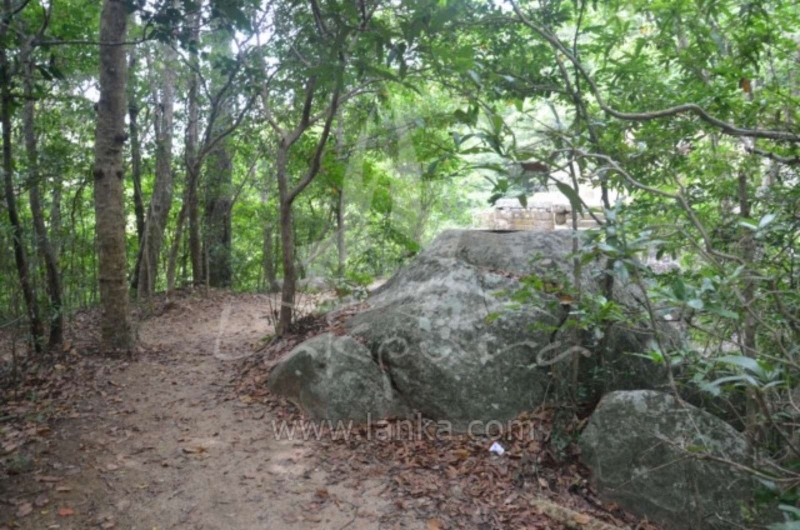 Another 5 km along a graveled yet motorable road leads to the foot of the mountain. 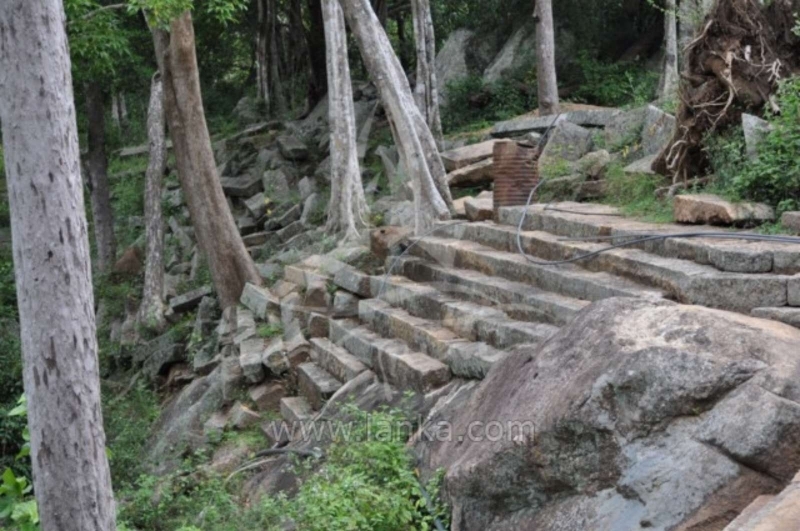 Ritigala is home to 70 rock caves that were believed to had been inhabited since the first century BC. 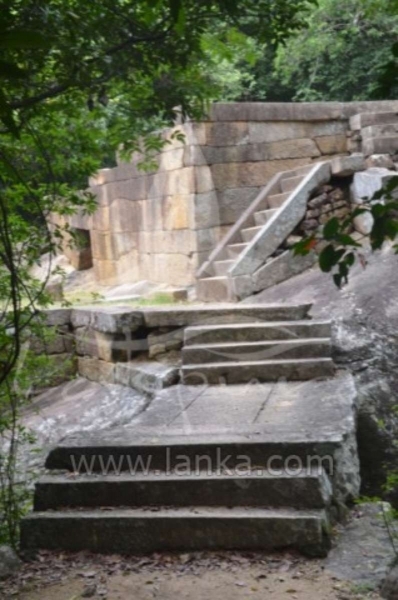 Mahavamsa, the great historical chronicle of Sri Lanka narrates that Ritigala was known by the name of “arittha-pabbata” during the reign of Pandukabhaya (377-307 BC), the third king of Sri Lanka. 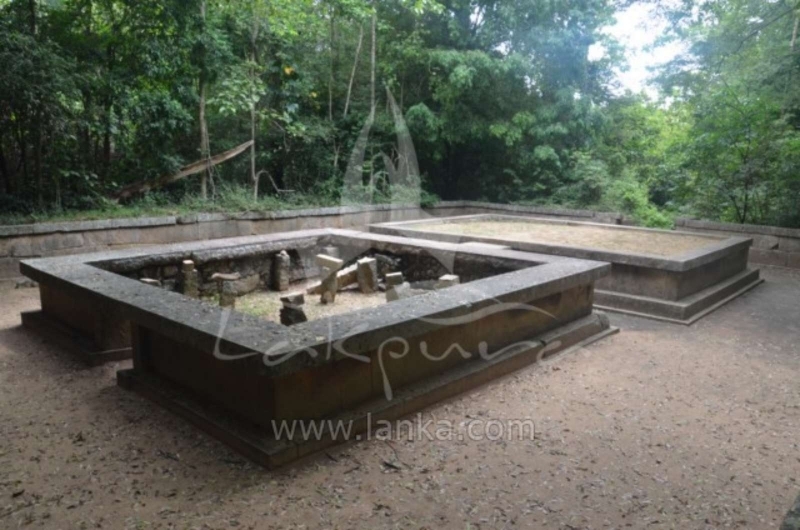 Since then Ritigala had been, at intervals, a sanctuary for the kings at war against the Dravidian invaders to the island till the 7th century: King Dutugemunu (161-137 BC) and King Jetthatissa in the seventh century. 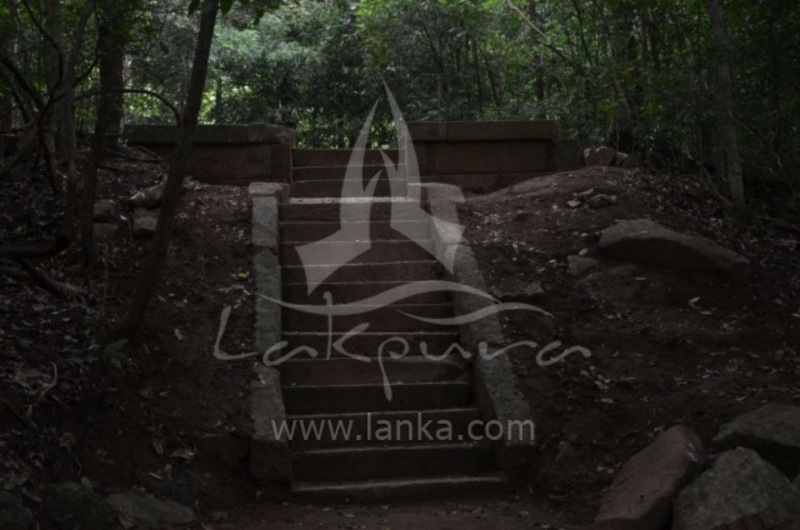 From the early days of Buddhism, monks had been living in natural caves or rock shelters. 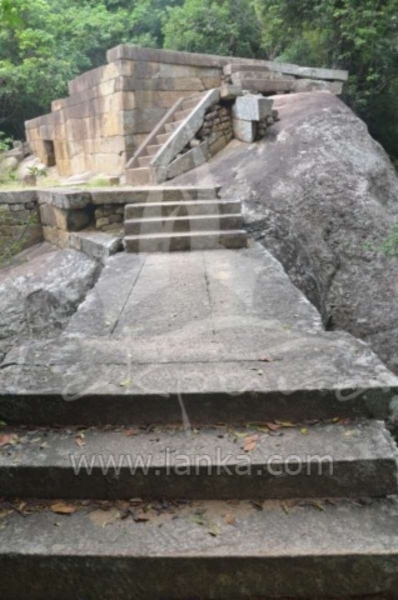 Rock inscriptions discovered at Ritigala indicate that gradually, the sanctuary became a monastic retreat for hermit (Pamsukulika) monks. 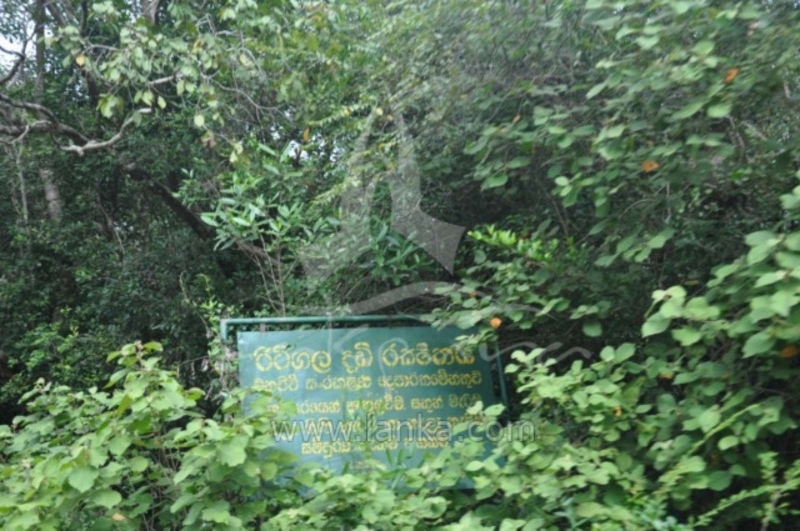 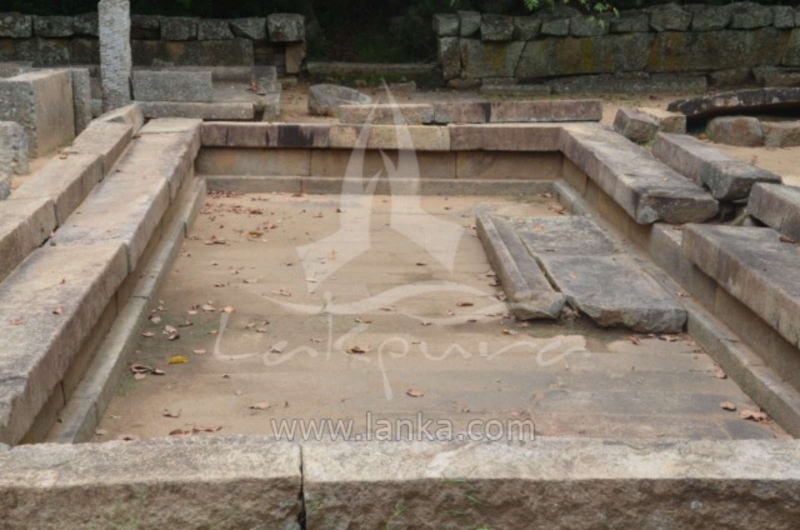 An inscription found at the site records that the Ritigala monastery was founded by King Lanji Tissa (119 – 109 BC) who also dedicated a reservoir to the monastery The monastery complex built with the tradition of Padhanaghara Parivena was endowed by King Sena the first (846-866 AD) for the benefit of Pansukulika monks who practiced extreme austerity. 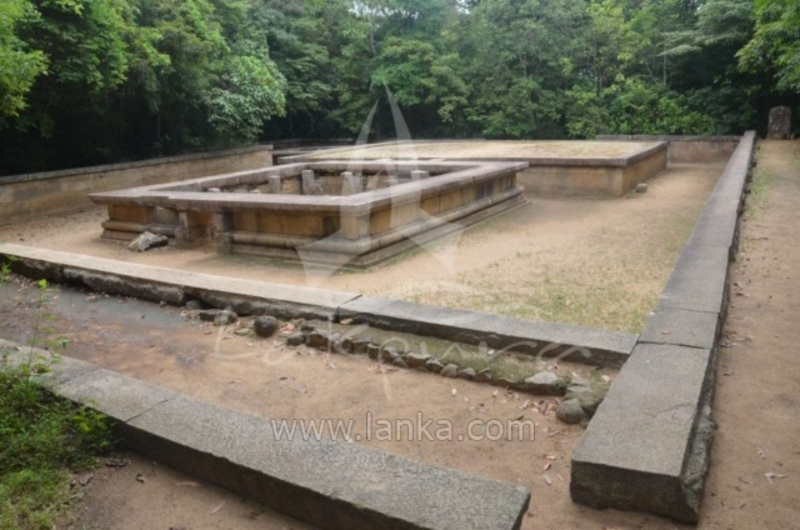 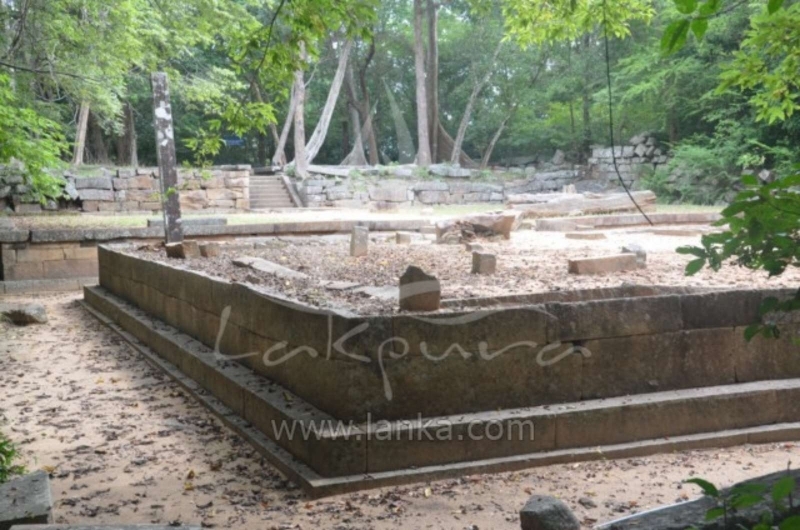 By the 10th-12th century AD however Ritigala seems to have been abandoned by the hermit monks, taken over by the jungle and forgotten by the populace. 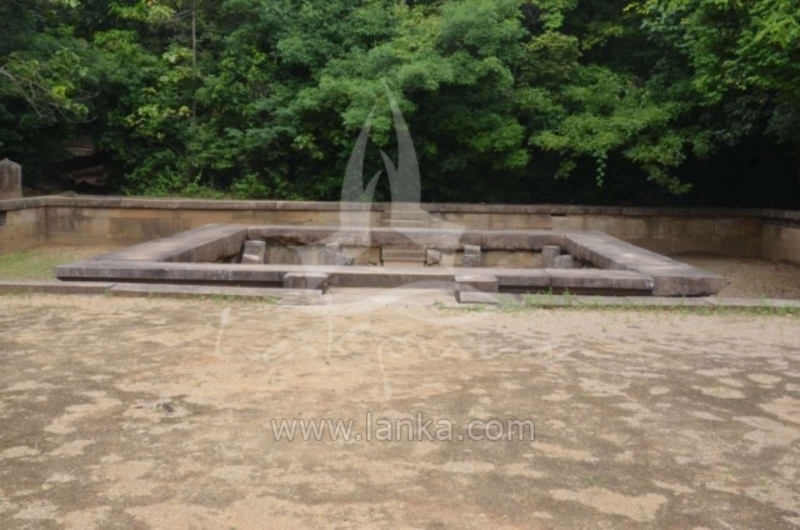 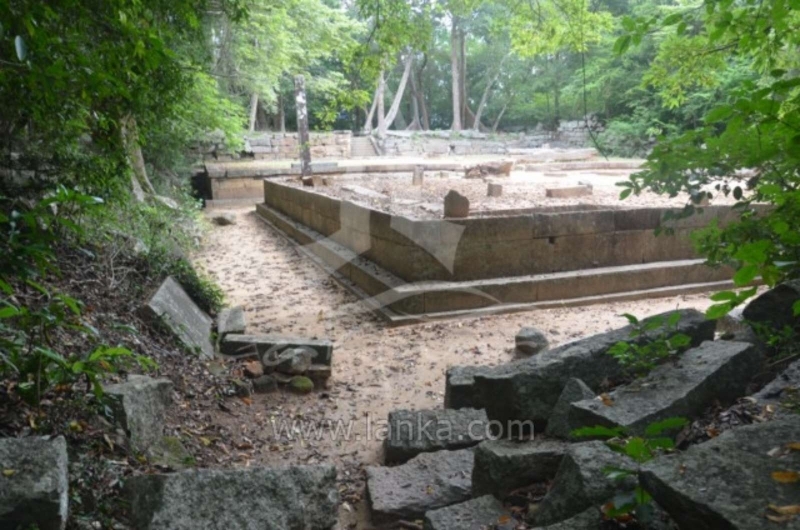 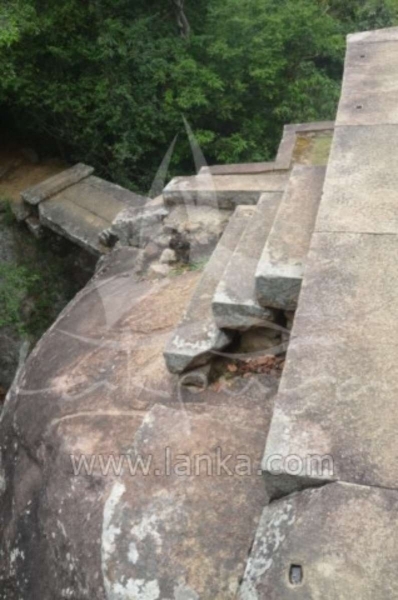 It is the ruins of this monastery that King Sena I (846-866 AD) built for the Pansakulika monks that the modern pilgrims see today. 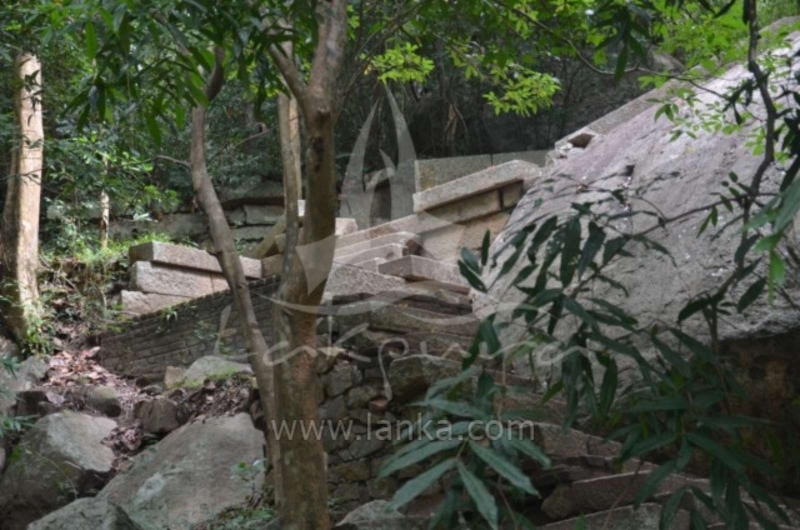 The Archaeological Department has sensitively restored many of the ruins. 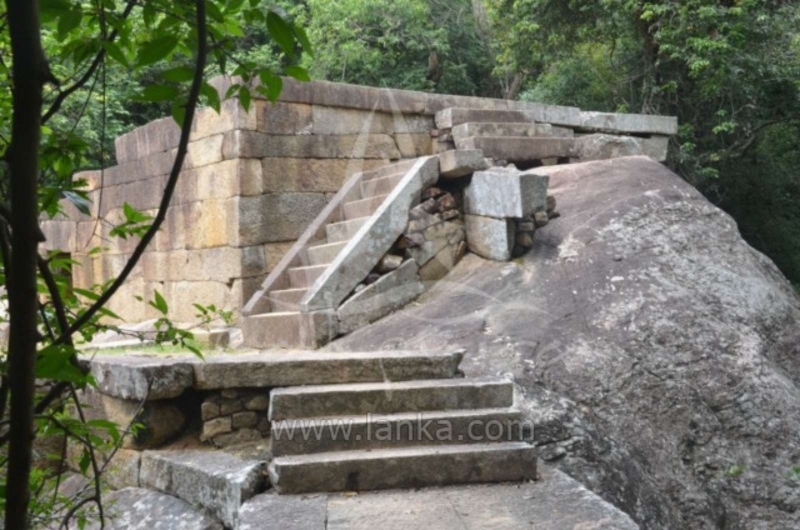 At the end of the tenth century, Ritigala came under the barrage of south Indian invasions. 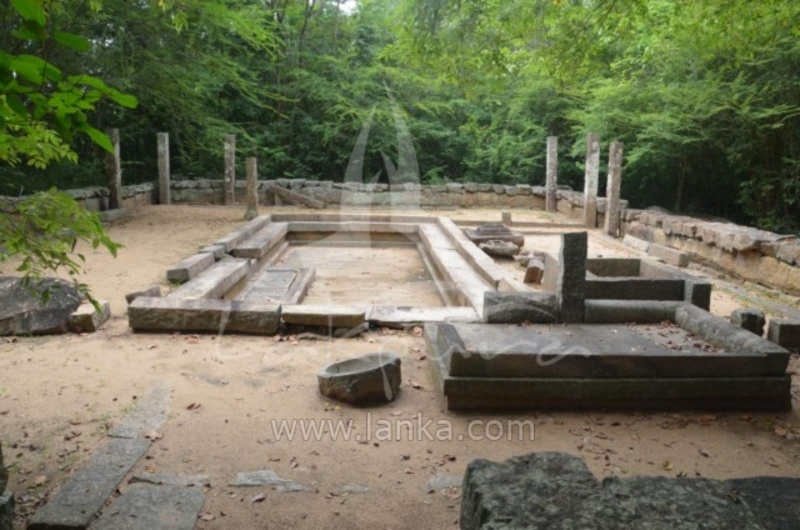 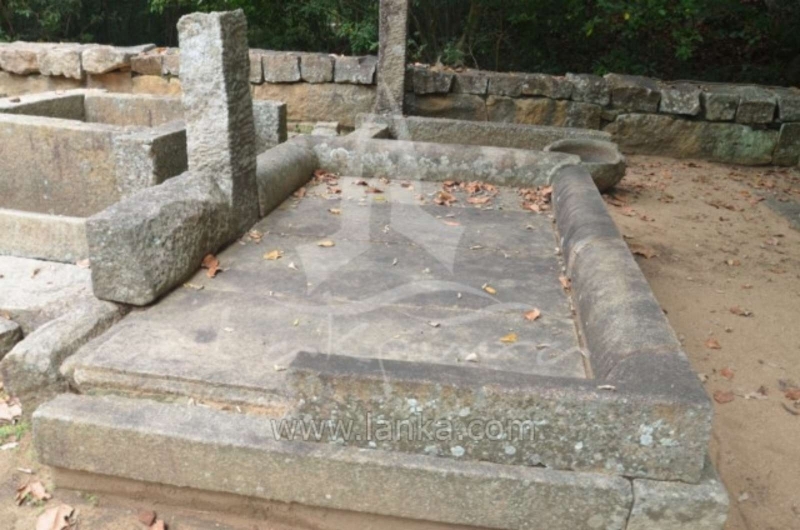 By the 10th-12th century AD Ritigala seems to had been abandoned by the hermit monks and soon it retreated into the jungles and rediscovered in the late 19th century by James Mantell, a government surveyor. 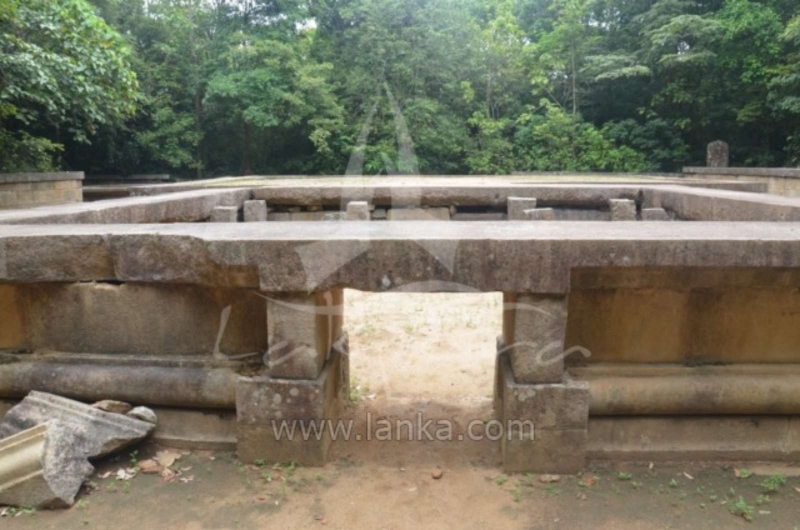 A couple of decades later, the first archeological commissioner in Ceylon H.C. P. Bell visited Ritigala and published a report on his archeological investigations. 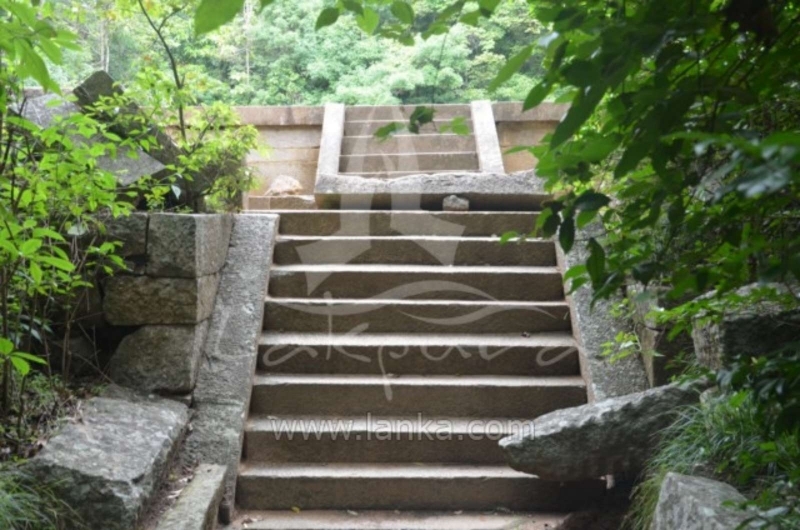 Entering the site of ruins of the monastery, the visitors come to a huge man-made reservoir with a circumference of 1,200 feet constructed by means of a bund across a valley down which two streams flow from the mountain. 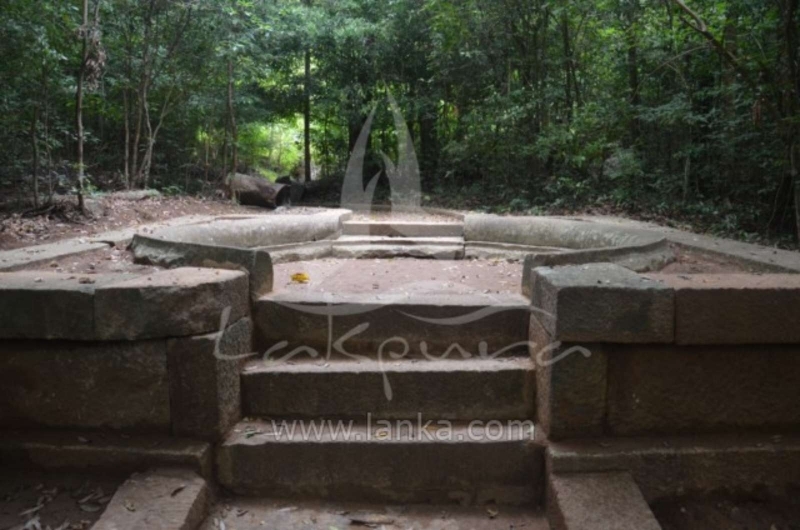 The inside is lined with stones meant to protect it and also to serve as steps for bathers. 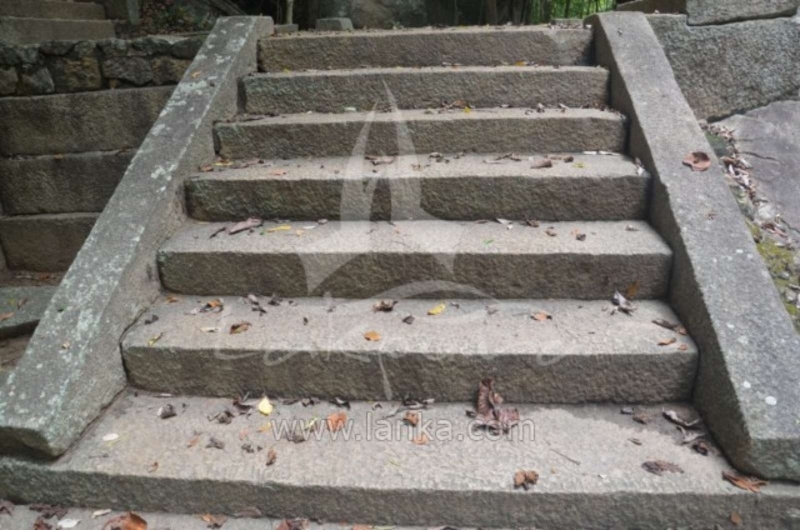 The top of the bund is also paved with large stones. 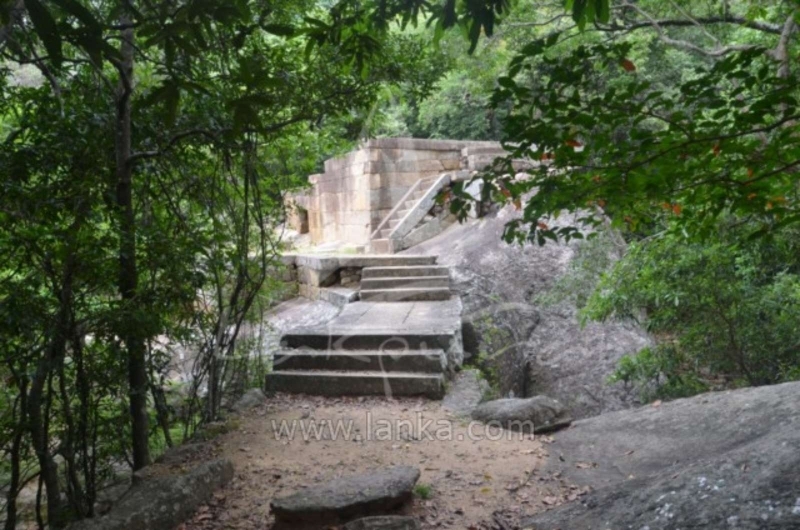 The path to the ruins runs along the southern bank of the reservoir, crosses a bridge, passes a circus and then leads to the first buildings. 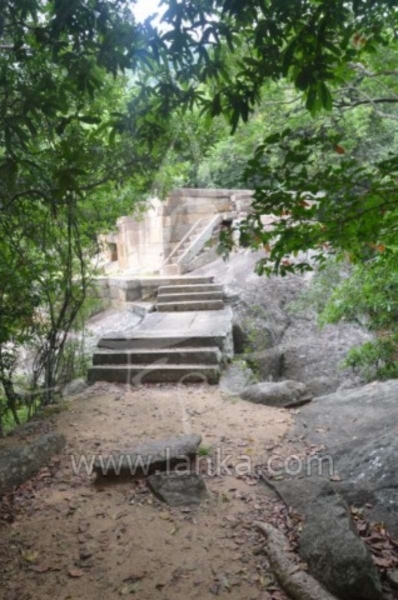 A short climb off the foot of the mountain takes the visitors to the ruins at Ritigala that are scattered over an area of about 120 acres. 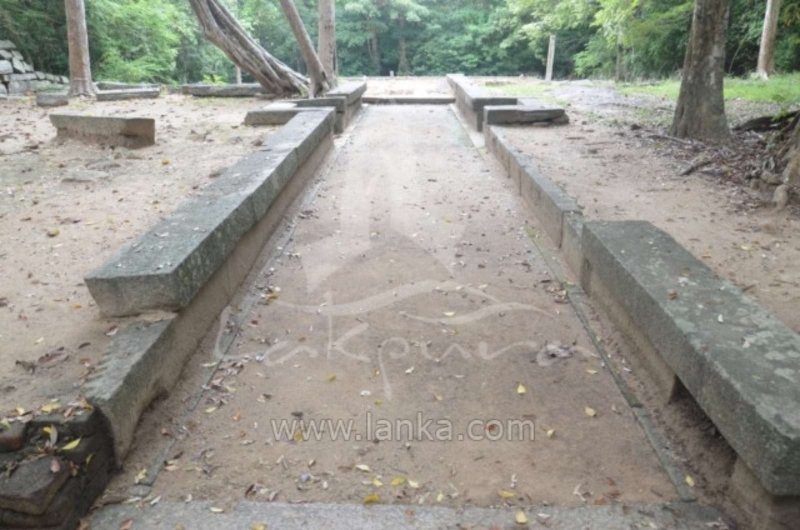 Turning right the visitors come a large rectangular building with a sunken and paved courtyard in its center with pillars around it: the refectory with grindstones and a stone trough. 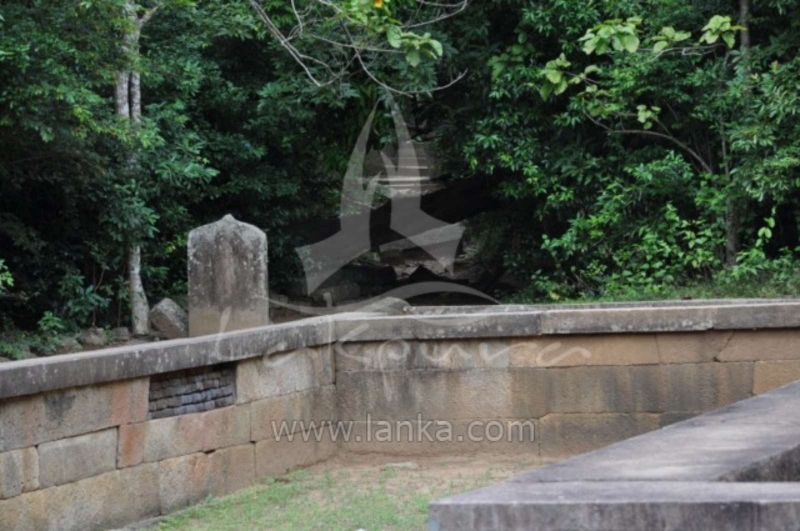 Just near the refectory is a large area enclosed by a wall which like most of the structures at Ritigala is made of huge finely cut and dressed slabs of stone. 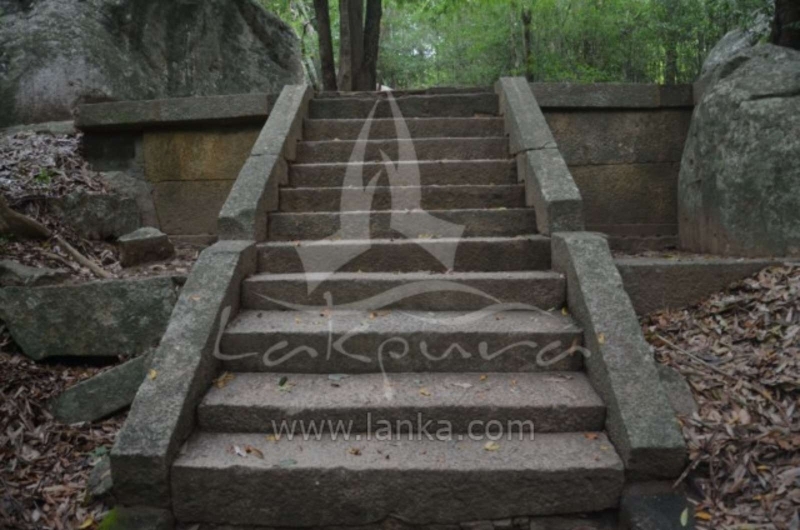 Within this area are two pairs of double platforms with stones fitted together hard and fast. 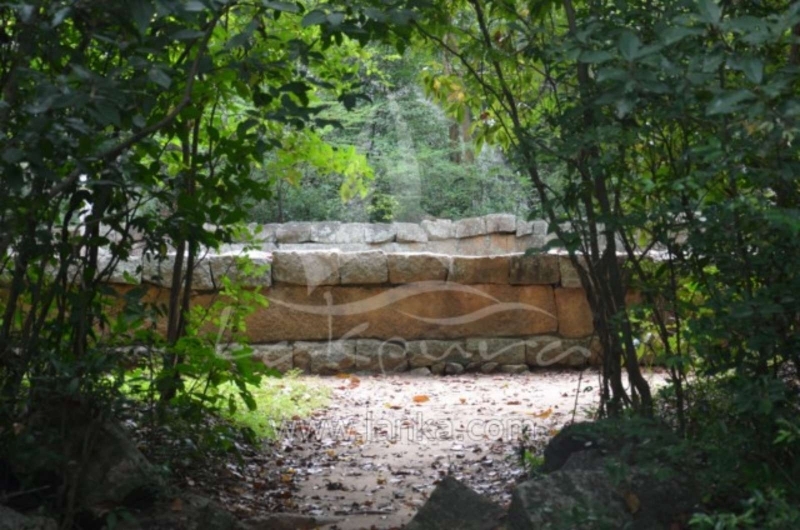 On the northern end of the enclosure wall is a path that leads down to a ravine then to a river where there is a stone bridge and a bathing enclosure. 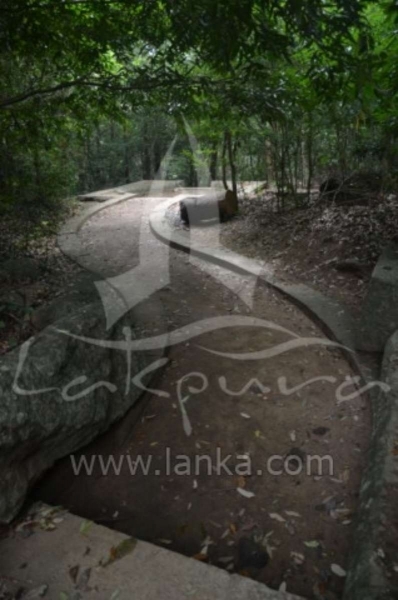 Returning to near the north-west corner of the enclosed area, the visitor finds a path leading westward through very thick forest. 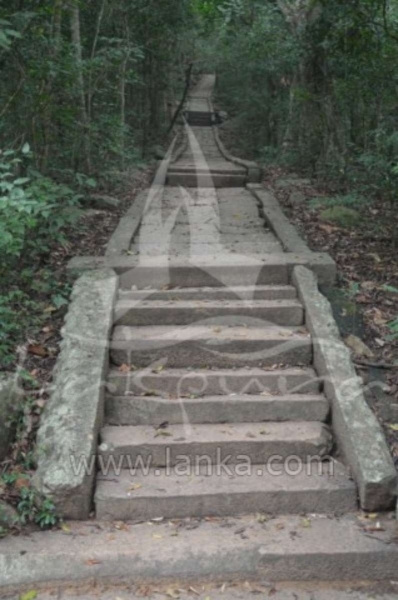 This paved path runs for about 1000 feet and has several flights of stairs interspersed by two roundabouts. 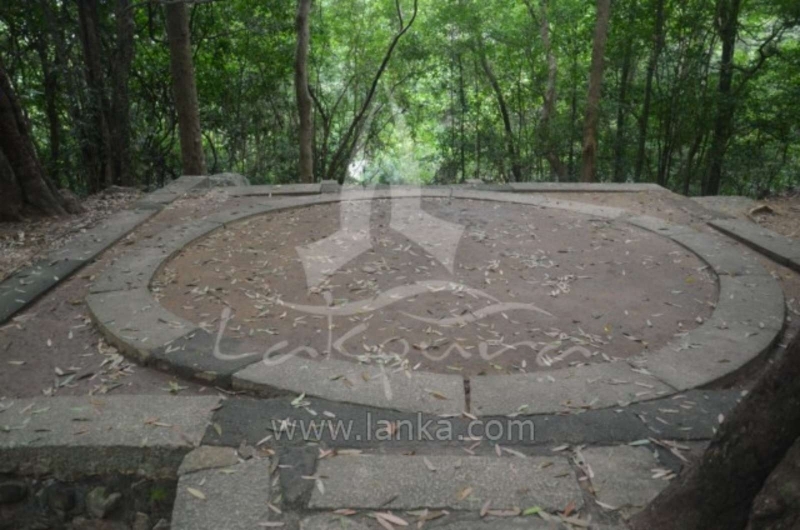 The first of these roundabouts, roughly halfway along the path, is the largest, while the second smaller one is towards the end of the path. 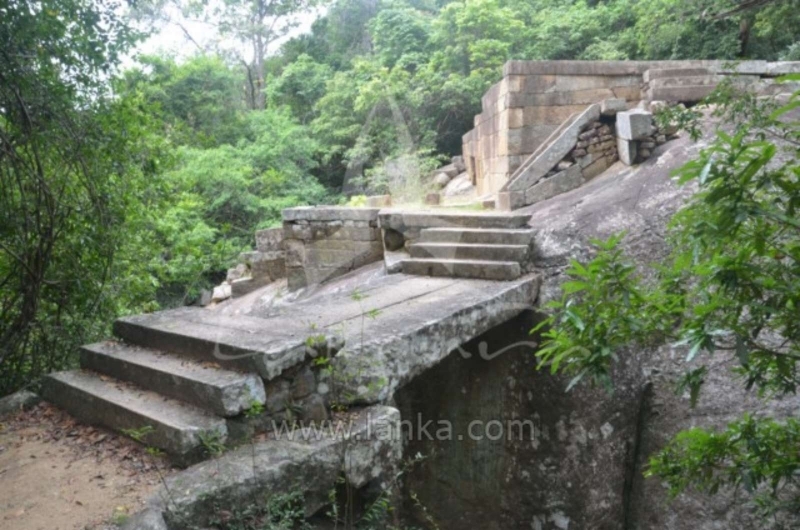 A little before the first roundabout a path leads off to the left to an impressive stone bridge, several double platforms and caves. 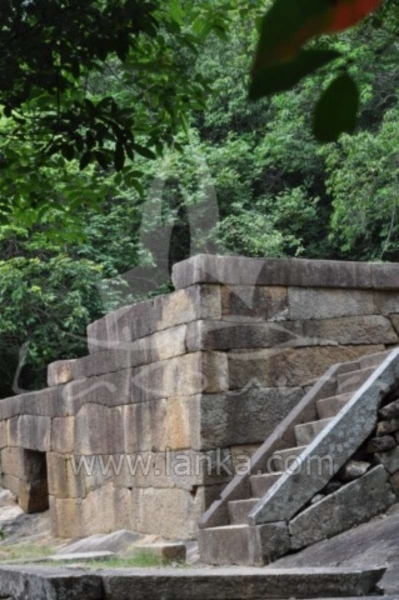 The double platforms are made out of huge slabs of beautifully cut stone and always occur in pairs, joined by a bridge. 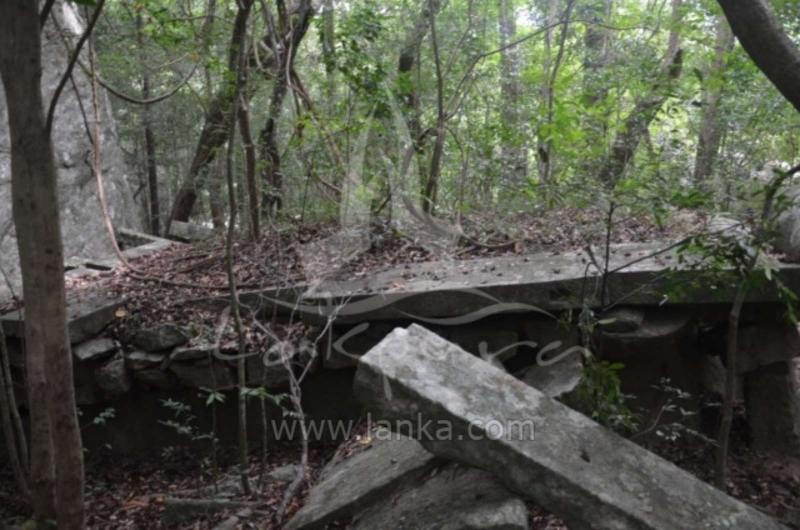 They are usually built on natural rock foundations and are always aligned in the same direction. 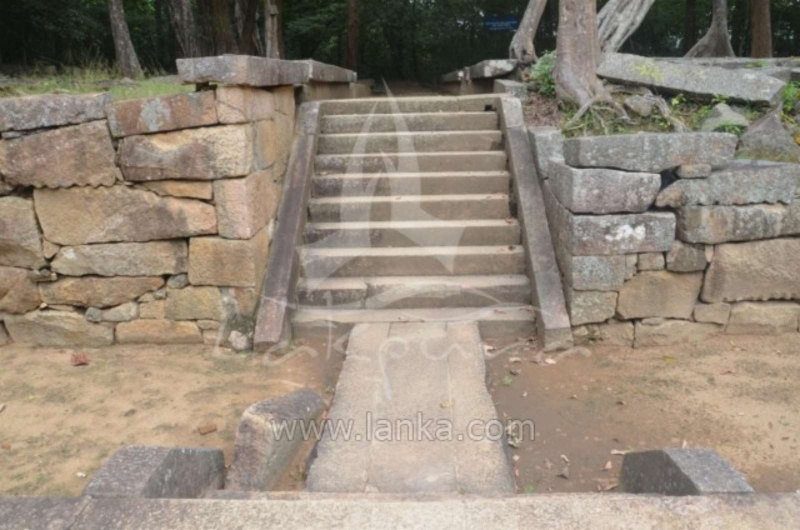 Near the platforms are found urinal stones some of which are elaborate carved. 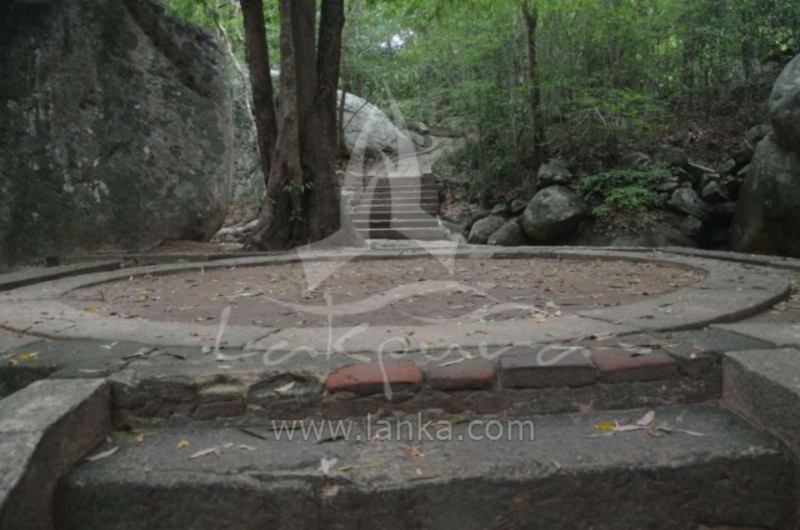 In fact, the urinal stone is the only feature in Pansakulika monasteries with any decorations on them at all. 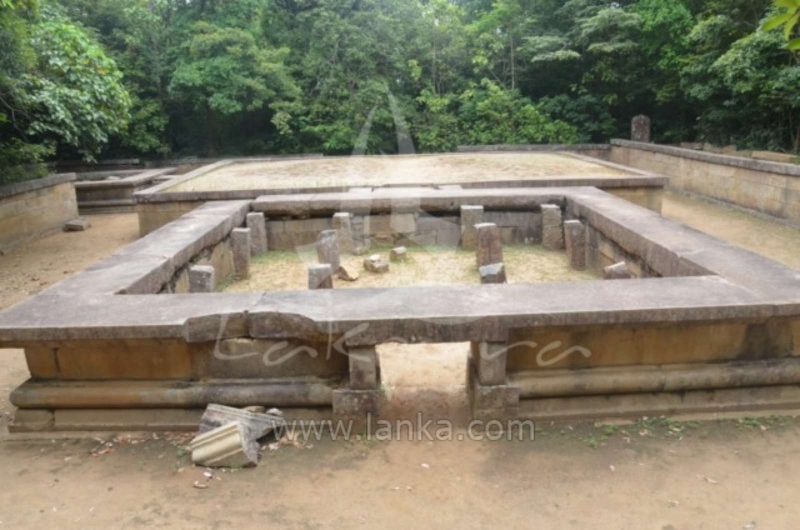 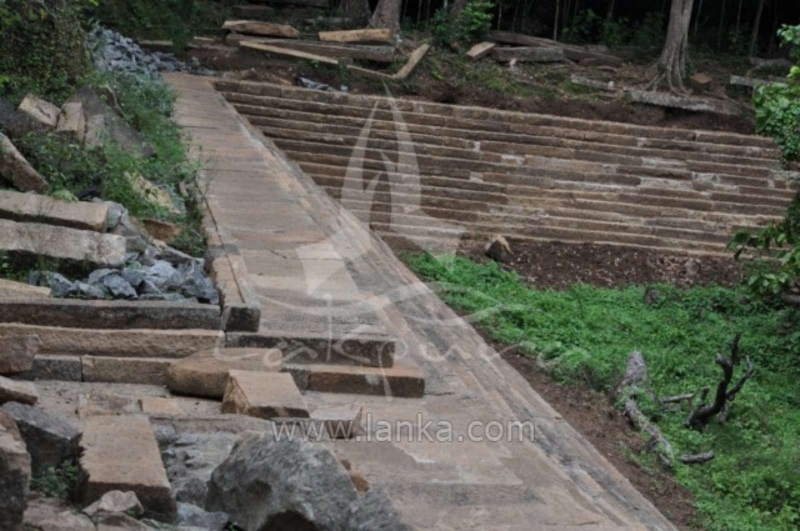 Ritigala monastery where Pansakulikas monks dwelled has no stupas, no image houses or temples. 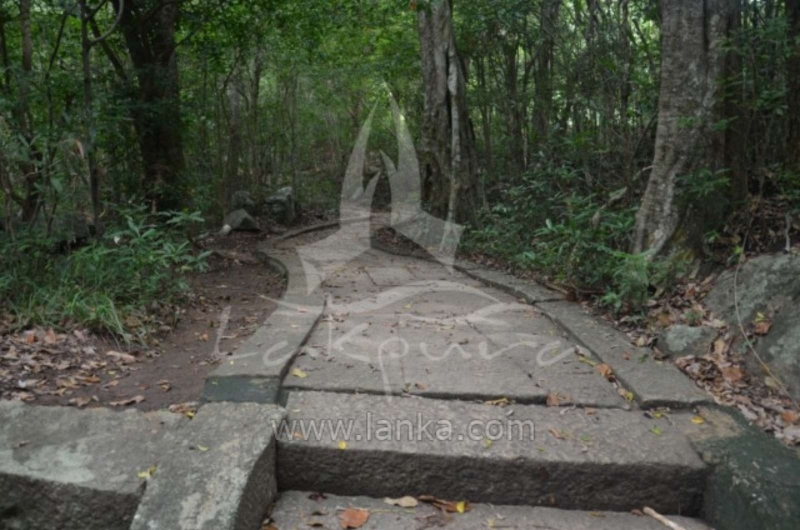 The long meditational pathway which branches out to the buildings while climbing up the mountain brings about tranquility in the jungle setting. 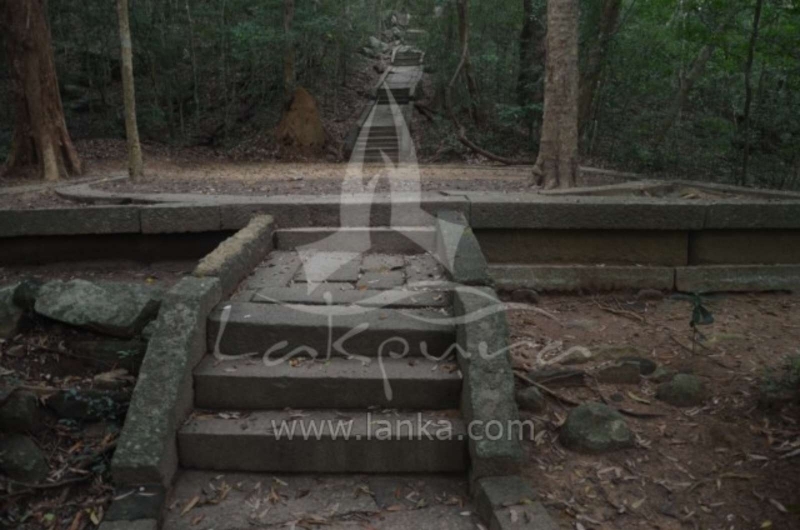 The architecture herein is in line with all other forest monasteries of Pansakulikas: certain mysterious features unique in Sri Lankan monastic architecture; long paved paths often with roundabouts in them; large stone-lined and stepped reservoirs; and unique double platforms.